Meet the ones responsible for your pet's well being. Pet Emergency? Call us right away at (740) 455-2273! Dr. Jessica Young and her staff welcome you to Animal Crackers Veterinary Hospital, a Zanesville Animal Hospital. Our mission is to provide our clients and their pets with expert medical treatment, preventive medicine and on-going client education so that each pet can live a quality life and be a loving, healthy companion and family member. If you are looking for a vet in Zanesville, Animal Crackers is South Zanesville’s premier Veterinary Hospital. We started caring for your furry companions in June of 2010, and we have enjoyed getting to know so many great people and their pets. We are veterinarian in Zanesville located in the shopping center next to Pick-n-Save on June Parkway. 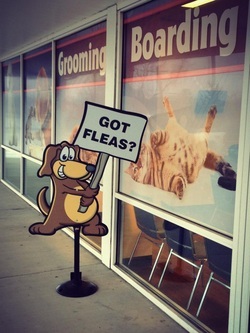 We are currently accepting new furry patients! We also offer animal boarding in Zanesville for our clients, so if you need to go out of town, call us and lets us provide for your animals while you are away. Dr. Jessica Young is a graduate of The Ohio State University College of Veterinary Medicine. She graduated from Lake Erie College as well as Philo High School and has been in private practice for the past six years. Troy is a graduate of Morgan High School, Zane State College, and The Cincinnati College of Mortuary Science. Carla is a graduate of the Vet Tech Institute of Bradford. Heather is a graduate of the Vet Tech Institute of Bradford. Clare is a graduate of the Vet Tech Institute of Bradford. "Just had my baby there they are amazing I told my sister in law and she is calling them for her pups and female after last fall and the vets refused to see my male pit cause they thought it was Parvo when he was poisoned I was so happy that they didn't turn us away when our new baby was sick great care and people there!�"
Please signup for our information newsletter!